Thinking of buying an E500. What am I getting myself into? Hey, I've been wanting a second car to mess around with. I'm a young guy with no hobbies and need something to waste time on. My main car is a 2015 BMW x3 35i, but I've been looking at older E500s. I've found a 2006 E500 which is fairly loaded but the seller wants quite a bit for it, $5800. Blue book seems to be around $4800. What kinds of issues should I be aware of? Mercedes extended the warranty on the SBC system to 25 years, and I'm aware that airmatic has issues and I'm okay with that. The car has around 155k miles, is the transmission known to fail around this mileage? If you get a nice one they ride like a dream. Smooth and powerful bulletproof M113 V8 engine with gobs of torque. 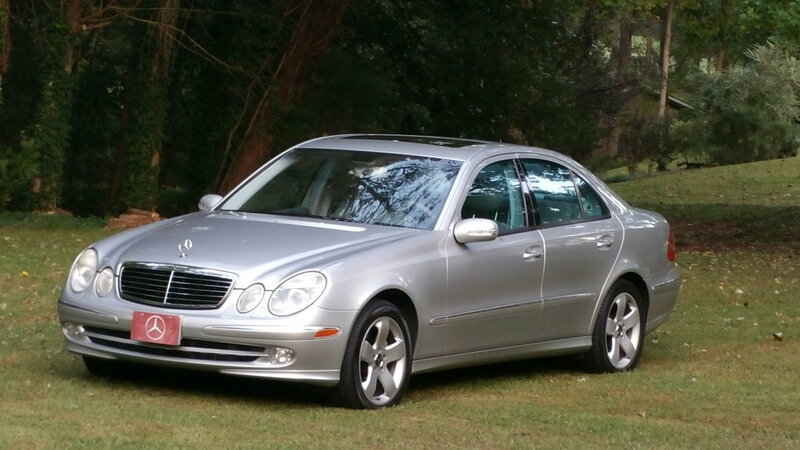 Bought my 2003 E500 two years ago with 86k miles and have put 28k more on it since with only routine maintenance. Done lots of upgrades and absolutely love driving this car. "BMW is something you want to take for hot date, but Mercedes is something you want to marry". Nothing wrong with getting both experiences. Very underrated in power, and definitely would put you back in the seat! She'll get up and pulls strong too. Ensure fluids get changed, and put some soapy H2O on her every so often, and she'll be ok! The 5 speed transmission is fairly reliable. The connection may develop a leak, but it can be easily replaced. Since owning my E500 Wagon, I've had to do regular maintenance as well as other things the previous owner neglected. If you can do the work yourself it like working on any other car. All of the E500s I've found have the 7 speed auto. Yeah I would be doing the work myself, I'm trying to find a hobby and I like working on cars. I'm going to make this a sort of project car if that makes sense. I haven't had much luck finding one, I've been looking for E500s on craigslist and they either know nothing about the car, or they raise the price as soon as I ask about the car. It is necessary to pay well over book value for one? Last edited by Nerdboss; 11-06-2018 at 09:30 AM. I purchased a 2004 E500 about 6 months ago. I have 3 other cars and this one is by far my favorite. I have had to do a lot in the ways of maintenance because the car was stored for 2 yrs. Mine is a M113 with 7 speed transmission. Other than normal maintenance I had to replace some suspension parts and motor mounts. The biggest issues with these are the brakes and air ride suspension. If you go look at one, make sure it has not been cranked or raised up by the seller. If there is a small leak on any corner or issue with the ride sensors or compressor someone can open a door or crank the car and it will raise up until the leak has had time to go back down, This will give the appearance there are no issues. I would get there early or come by later to make sure the car hasn't leaked down. Mercedes just issued an extended warranty on the SBS brake system so that is no longer an issue. I buy all of my parts from FCP Euro. YouTube has a ton of DIY videos on how to repair things. 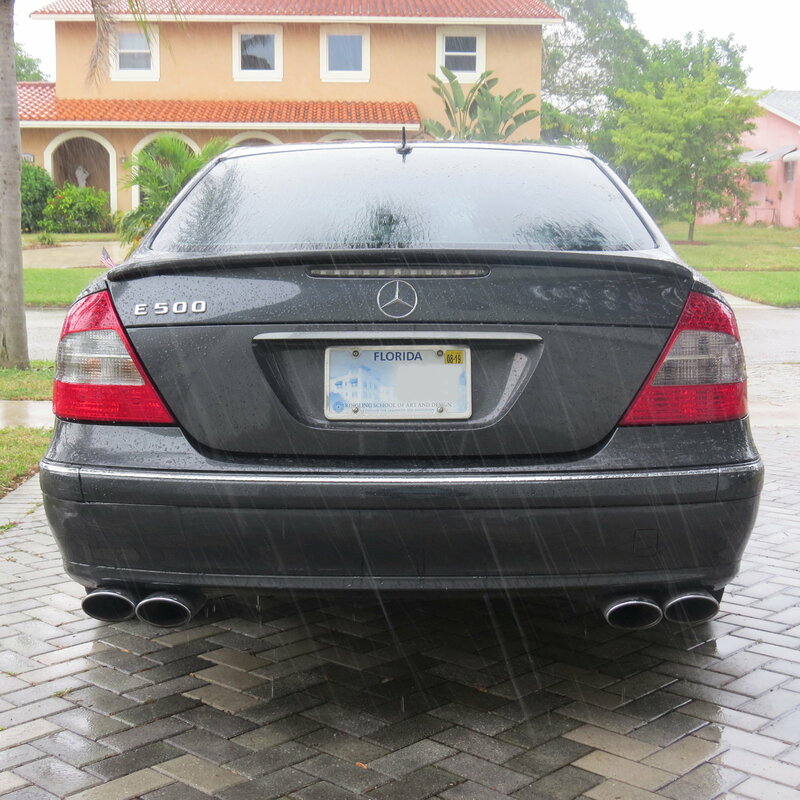 If I was buying another car I would probably spend a little more and get the E55 but I would stay with the W211 chassis. I like the spoiler and exhaust tips. Did you buy it like that or upgrade? How much did you pay for your E500 if you don't mind me asking? How many miles? If it has Airmatic it WILL fail and become a problem. Also the Crankcase Position Sensor tends to fail and cause a no start condition. 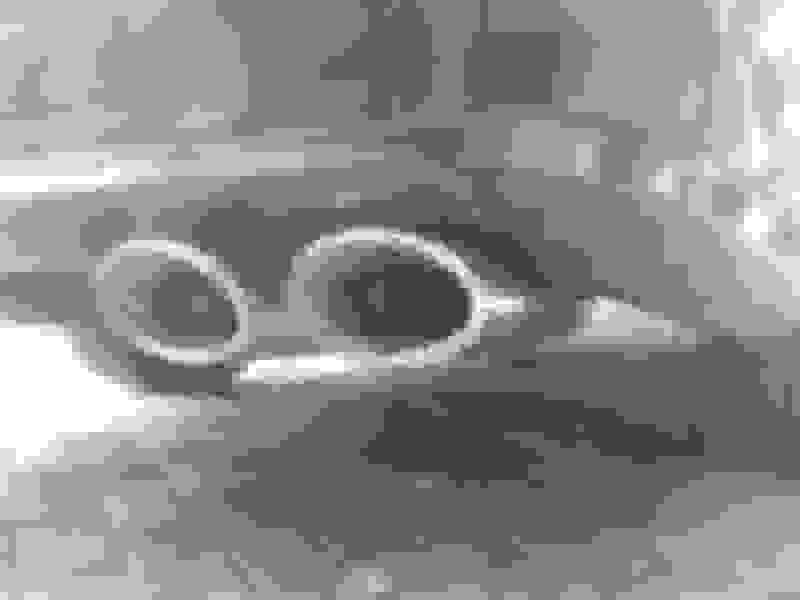 The ATF oil will need to be changed because the 722.9 is prone to failure if not. I paid $3200 and have spent around $2k. Oh yeah, there was also the gas tank issue. There is a problem with the filler neck in the gas tank. Mercedes just replaced mine for free. That is certainly true. If you are not ready/can't afford I wouldn't buy a Merc. I paid around $600 to replace my rear bags. I like the spoiler and exhaust tips. Did you upgrade them? Yes, Lorinser style spoiler from eBay, AMG E55 mufflers from Craigslist, Eurocharged mid-length headers and ECU tune, Speed43 custom airbox, resonator delete with X-pipe install, Sprint Booster. Car HAULS *** (for an E500). Did you have to replace the bottom lip of the bumper/diffuser? I am assuming yours started like mine with no visible tailpipes/exhaust tips. Who did your ECU tune? Where did you find yours for sale? 3200 isn't bad at all, much better than the 6k they want for them around me. I don't mind doing work, that's actually the whole point. I want a project car I can mess around with and enjoy without worrying too much. I have a really nice BMW X3 35i that is my main car, it stays in the garage and I don't do my own work on it. Last edited by Nerdboss; 11-06-2018 at 02:12 PM. The exhaust shop that welded in my AMG mufflers used my dremel tool, the contact paper and template I provided to do the bumper cutouts - guy did a fantastic job. ECU tuned by Jerry and Eurocharged - highly recommended. Honestly $6k is about right depending on mileage for a fully sorted example. I was able to get a great price because the car was stored for two years. I started going through the price of basic maintenance items and reducing this from his asking price. He didn't know when the transmission had been serviced -$330. The brakes all the way around including rotors -$500. He couldn't find the spare key -$300. The biggest thing was the air ride had never been replaced. The dealership will quote you $3k+. I cant stress enough how important it is to get a pre-purchase inspection from a Mercedes dealer or someone very familiar with these cars. Your average mechanic doesn't have the knowledge or Star system to detect issues. Most don't even know how to check the transmission fluid (doesn't come with a dipstick). I am not a mechanic, much like you're wanting to do I bought this car to learn. I figured if I can work on a Merc anything else is child's play. Go on YouTube and look up LegitStreetCars, he does an inspection on a E500 for one of his friends. There is a lot of DIY stuff on his channel for the W211. Last edited by Chris Downing; 11-06-2018 at 02:24 PM. Oh believe me I will be getting a PPI before I buy anything. The car has 170k miles and doesn't have service records for the transmission or anything. Some of the air suspension has been replaced but not all of it. I think 6k sounds high, being that it's not perfect. But if I can't find one I may just give up on the idea of a project car for now. If you like the car offer him $4500. Chances are no one will pay $6k unless it was perfect. Leaves you some room for any issues. All he can say is no. The GOOD news is that there is SO much DIY info out there for this car. I am by no means a mechanic, and I do all my work at home. Check out technical articles from Pelican Parts!! Already did, they turned it down. There's another one around me for 4500 but it doesn't have cooled seats or HK audio. I would assume there's plenty of these E500s around though. Try using autotempest.com. I just found about 20 within 200 miles of me. Wasn't really anything around me on that site. I think I may end up considering this one for 6k, so maybe I'm crazy. It's a 2006 with 155k miles and has most of the options, HK sound, heated/cooled nappa leather seats, nav, moonroof. Looks to be in good shape with just the usual wear. Quick Reply: Thinking of buying an E500. What am I getting myself into?